You will be given a reference e-book to read which has 308 pages And the test will be based on that e-book , you can take the test after 10 days Of purchase. "This Certification course is based on well-established theories of Axiomatic Quality which are axiomatic design and robust design." It gives a comprehensive approach to quality. Implementing this system could prove challenging in specific industries but the earlier it is introduced in your company or organization, the sooner and better will be the results as well. This course gives guidance for producing systems that operate at highest quality levels, and it also shows the way to achieve six sigma levels. It is essential for any company in any industry to have products that are superior in technology, design, reliability, cost, and quality. It introduces you conceptual design for a capability which is a framework that has the tools to reduce conceptual weaknesses of systems. It also gives you ways on how to reduce quality losses and how to control product costs. This course will try to bridge the gap between quality methods and scientific engineering methods of production through mathematical relationships. "This course takes you through the different stages of the process and product development and how the different decisions made during such processes impact the quality of the product." It gives you the different aspects of axiomatic design such as different domains in the design world. Separate well-structured chapters take you through axiomatic design methods, axiom information and design complexity, quality engineering from an axiomatic perspective, aphoristic quality and reliability process, etc. It introduces you to the conceptual design for capability phase and also axiomatic quality optimization. The first chapter of this course introduces you to axiom quality process, six sigma, robust design and design for six-sigma. The next chapter will give a basic idea of the axiomatic design method. Concepts such as axioms, design domains, design mappings, hierarchies and design vulnerabilities discussed in this chapter. The next chapter demystifies independence axiom from a theoretical and practical perspective. It also describes how independence axiom formulated mathematically. Introduced with coupling vulnerability that occurs in the design entity when an independence axiom is violated. Next chapter, chapter 4 discusses information axiom from axiomatic design method. Another important concept discussed in this chapter is the operational vulnerability occurring due to a violation of information axiom. Quality engineering is presented in the following chapter and also its association with axiomatic design and axiomatic quality. The axiomatic quality process discussed in detail in chapter 6 including CDFC phase, optimization phase, and the customer attributes-to-functional requirements phase. The core of CDFC phase, concept selection problem introduced in the following chapter and the next chapter also explores CDFC phase in detail. Mean adjustment and variability optimization techniques of axiomatic quality optimization phase covered in detail in chapter 9. Case study is covered in the next chapter and the last chapter reliability engineering and its relation to the axiomatic quality process. This course will be hugely beneficial for engineers, managers and other professionals who want to improve quality by successfully deploying the most advanced methodology to tackle system weaknesses. Any engineer or manager or other professional can learn the basic principles of axiomatic design from this course and apply it to their daily tasks to improve their performance and the performance of the organization they work. All companies or organizations should encourage their engineers and managers to take up this course. It can only serve the best interests of the company as it will see a boost in the overall performance of the company especially regarding efficiency, technology innovation, profit, and reputation as well. Maintaining quality of product or service is very important for the survival of any company. There are new concepts and methodologies in quality that one can adapt to ensure quality. 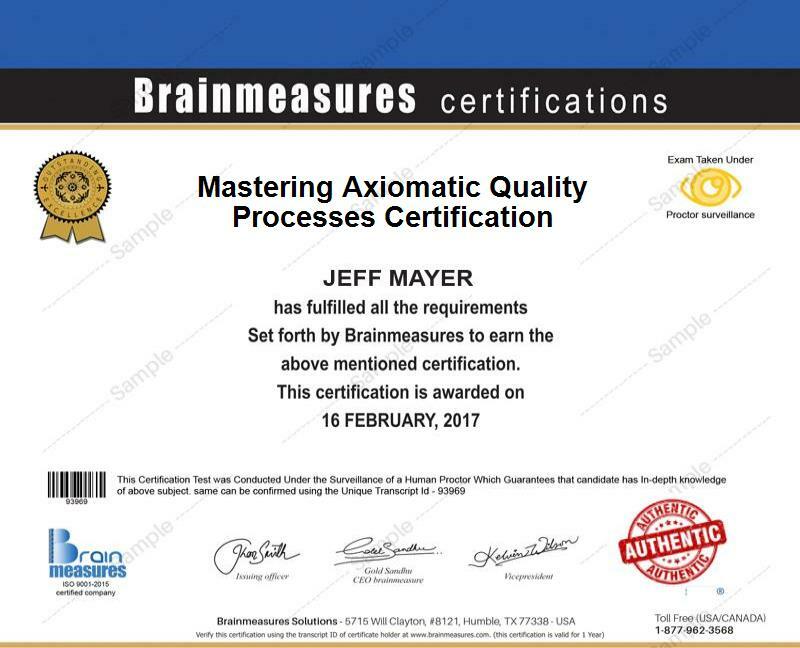 This course is one such opportunity to learn about axiom quality processing that and this course ensures that with its completeness and comprehensiveness. Explained in depth with enough details. This course will help in developing practical skills that are required to apply axiomatic quality process in any industrial context. Combination of axiomatic quality processing and six-sigma is the best combination that you could have on your resume. It could be your best chance to grab an opportunity in any company of your choice. Many companies have realized that profit and growth of the business are directly related to the quality of the product which is why they are adopting to axiomatic quality processing that focuses on the full quality of the product or service. Any company that is taking axiomatic quality processing will be looking for professionals or engineers who have undergone training in the area. Your opportunities would be many across different industry sectors if you specialized in quality with mastering axiomatic quality processing certification. If your company is starting to adopt this quality processing, your knowledge can be of great value to your company as you will be able to contribute immensely and thus your career prospects in the company as well. As it is a concept that requires quality initiatives in all the departments of the company, even if you are not in quality, but an engineer or manager, it will benefit you as well in performing better. This course will be a great addition to your resume as you will be preferred over someone else with the same primary qualification. It can also help you perform your day-to-day tasks at your workplace better which will be counted when your promotions considered.